OK this is what I was trying to tell you all was so important about Sept. 7th. We are going on a cruise with ALL of our friends, for Annette's 20th (x2) birthday! I know some of you were thinking that I might be pregnant, but no, we are finally taking a vacation! Yeah! Western Caribbean here we come! Last night, we learned that our beloved Prophet and President of the The Church of Jesus Christ of Latter-Day Saints, Gordon B. Hinkley, had died. 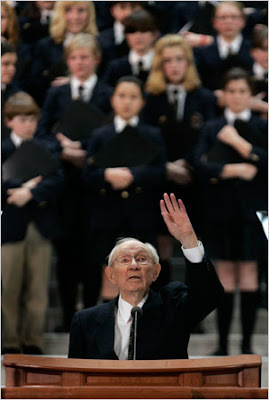 He was 97 years old, and has lived an amazing life. Pres. Hinkley has been the prophet since I was married twelve years ago. I know that there are many experiences in my life, where I have turned to his counsel and strength, to become a better person. He will truly be missed. As I explained all of this to my kids this morning, I truly knew that he was in a better place, with his wife and loved ones. What a beautiful reunion! "In all living, have much fun and laughter. Life is to be enjoyed, not just endured." I am going to try to enjoy life even more and look all around me at the little blessings in my life. I went out to my van yesterday, to go visit a few friends, and my lips were so dry from the heat turning on every other minute at home that I needed some relief, and my lipgloss was frozen....SOLID! It is cold here, a frozen tundra is the scientific term, I think. I know I have said it before, basically to anyone that calls to talk, but it is cold, cold, cold! "I have lots of friends, huh. Avery, Hallie, Jordan, and Dana." (Three of the four mentioned are under the age of four...the other friend, is......29?) Have a great day! 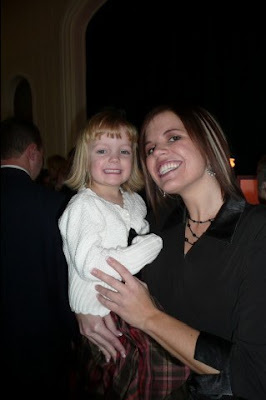 I almost forgot: Happy Birthday to my Middle Sis, Maren! *I had to edit this post because it sounded like a bit of rambling! Hope this is better! I am grateful for two things today, probably more, but I can think of 2 specifically. I received my camera back from SONY yesterday. I have not taken a picture for over 22 days, I was starting to feel withdrawls. The second thing, is my son Christian. We had a nice afternoon together, after he had an emergency dentist appointment to have a tooth pulled. We went to lunch and leisurely walked through Barnes and Noble together looking for books. It was fun....I love him, he drives me to want to be a better mom, because I want the best for him. Love ya, buddy. Since I am late on sending a card, this is where I am going to wish my Dad a Happy Birthday! My Dad is great, he is the reason that I LOVE books. He is an example to our entire family. 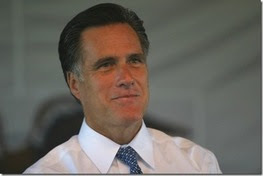 We love him and he is a fantastic Grandpa. His quiet personality has always been a strength to me. I love him....Happy Birthday Dad! **Edit: O.K...so the last picture was the most current picture I have....but I guess this is a better one? Most memorable birthday? My Golden Birthday, when I turned 27 on July 27th. When was the last time you cried? Last week, I received a unexpected note in the mail. Just last Friday, I was telling my friend that I needed a new pair of scissors. My scrapbook scissors had recently been taken out of my scrapbook bag and put into the junk drawer so they are used to cut everyday items. We use them to open boxes, cut wire, open packages, everything! I was trying to cut something for a scrapbook project and I could tell they were pretty worn out. This one just came together effortlessly...this doesn't happen very often...but I think the subject of the layout also made it very easy. This is my SIL. Since we are both married to Garner boys, and share many of the same 'life experiences', we talk almost every day. This is my 2007 Christmas cards! Also, this was my first try at the trees...loved making them! I have been taking a break from NYOBC since last summer, and I had a chance to work on a few layouts for this month's book Be Mine. 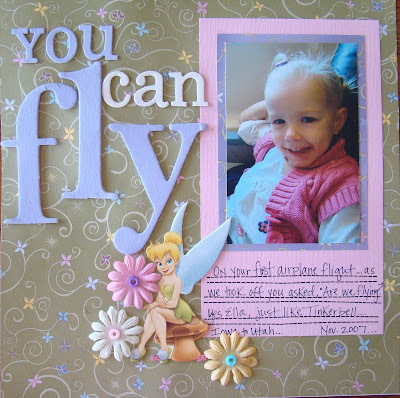 NYOBC is a great way to get a jump start on your creativity. After I made these three pages, I couldn't stop! 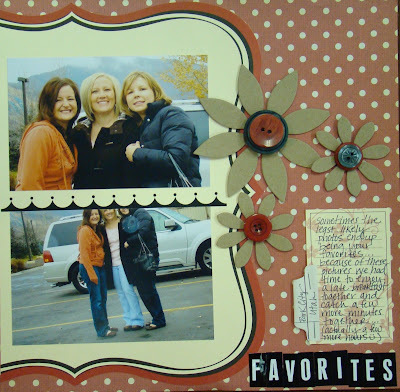 I have several more scrapbook pages to show...and I am also trying to catch up to Candi and how she is sticking with the Layout A Day Challenge. 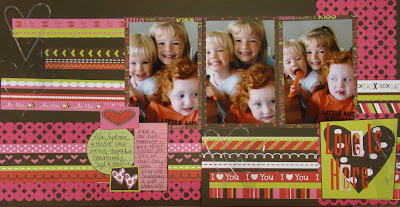 Great job Candi...go over to her blog and check out all of her layouts, they are amazing. 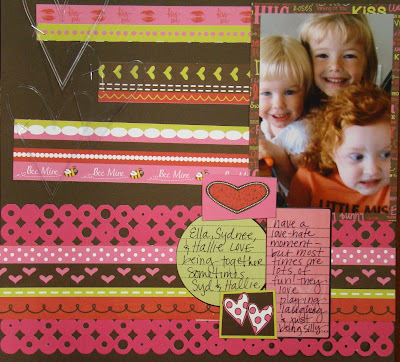 Just a few notes: the chipboard heart on the "Love At First Sight" layout is covered with strips of ribbon. I just put some adhesive all over the heart, laid the ribbon on it, then flipped it over and trimmed off the excess. (This was an idea that I saw on my Autumn Leaves 2008 Calendar.) 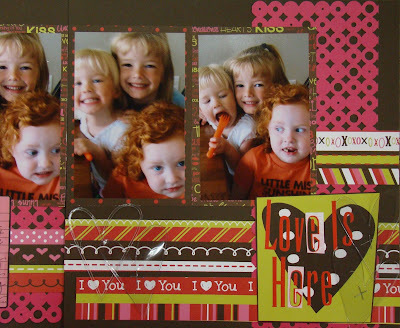 On the "Love Is Here" layout, I used the negative space on my letter stickers because I ran out of E's! I am always running out of letters when I try to do titles and/or journaling, so I am going to start saving the letter sticker sheet and use the negative space! 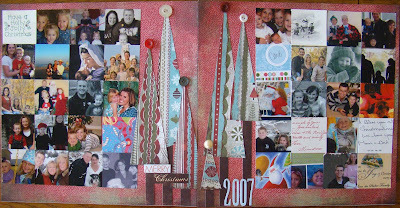 (Also an idea from the Autumn Leaves 2008 Calendar) Happy Scrappping! Last Thursday, after flying from SLC back to Iowa, I went to the Iowa Caucus. It was quite an interesting experience. I really didn't know how the process worked, but it is nothing like a regular election where you show up at your polling place sometime throughout the day, vote, and then you are out of there. Caucusing is nothing like that at all. Everyone shows up at your polling place at the same time. I was assigned to the Jr. high school and when I got there 15 minutes before 7 pm, the parking lot and side streets were packed! I had to park in the back of the school where the snow had not been plowed, I almost thought about going back home because it was a little bit frustrating and freezing, but thinking of my Cousin Daniel, who wanted a full report, I had to move forward. Once you get inside, there was a room designated for Republicans or Democrats. We all just sat in our room, but not in different areas for each campaign. I was handed a few pieces of scratch paper for voting purposes. After a representative from each campaign spoke for two minutes about why you should vote for that particular person, then we wrote down our vote and then the votes were counted. We never broke into the different groups and tried to persuade the people to vote for another person. They just took our votes and said they would call them in to the state caucus in Des Moines. Our precinct had 28 votes for Romney, 17 for Thompson, and 10 for Huckabee; the others didn't have the 15% of votes to move on. I am glad that I was able to have this experience. What is interesting about it is that it takes the anonymity out of the voting process. Typically you go in to your little booth, fill in your bubbles and walk away and nobody knows who you voted for. This is quite different because you stand in a room with all of your neighbors and everyone sees who everyone is supporting. Everyone had stickers, or met with a person that was in charge of a certain campaign within our precinct, so everyone knew who your support was for. After we were done, I wasn't stuck in the snow behind the school, and I gave my neighbors a ride home. Some would say that this was a pretty uneventful evening, but I was glad I experienced the Iowa Caucus....the beginning of the campaign for the 2008 Presidential election. Sorry Daniel, no pictures. Have I told you that I love reading? I have always been a reader. It all started when my older sister went to Kindergarten and learned to read. She came home and taught me to read when I was 4...I haven't stopped. Right now I have too many books that are on my list. I saw this picture in a magazine and had to post it, especially since my camera is being fixed and I can't take any cute pictures. This inspired me...I would love to have this many books to decorate my house with. 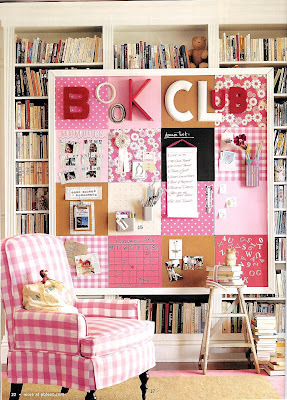 And I could make this display to keep track of my book club. We are having our 10th anniversary this year. There are thirteen woman, thirteen amazing women. 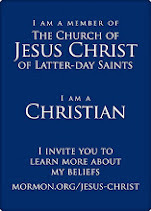 Well, I am getting off the subject...what are you reading right now? I took the 6 am flight to Atlanta. About an hour into the flight, I was amazed by a sight that looked something like this. I took out my camera to get a picture and I had left my battery at home. I thought of Grandpa during the entire flight. 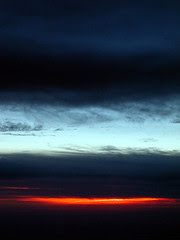 Since he loved taking pictures of sunrises and sunsets, I thought he would have liked this one also. While I sat in awe of this breathtaking sight, I thought of a song by Cherie Call. It passes all my understanding." It passes all my understanding"